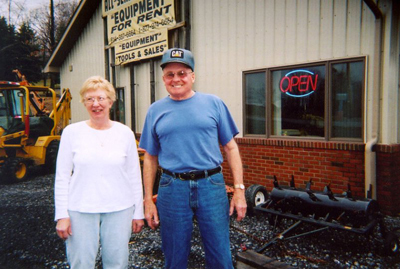 Bill and Dorothy “Dot” Morgan are the owners of All Season Rentals along route 144 just outside of the town of Snow Shoe. They have been in business for 3 1/2 years. Bill was the other half of Johnson and Morgan Coal Company that operated out of the same site for a good many years. Bill and Dot have four children—Bill Jr., Bob, Jerry, and Cindy and seven grandchildren. They have both been avid supporters and members of the trail and the use of their equipment helped facilitate the installation of our 5 bridges. When the snow got ahead of our regular plowman, Bill opened up the Gillentown Trailhead and parking lot this winter with a dozer. We’re looking forward to a continued partnership with All Season Rentals in the future—stop in and see their vast selection of equipment, automotive, carpet and floor care, heaters, ladders and scaffolding, lawn and garden, concrete/masonry, power tools, pumps and generators, saws, washers, hand tools and lots more.